Your gutters need to be cleaned every year. By doing so, you can protect your home from the many issues caused by clogged gutters and eavestroughs. Such damages are often quite expensive and time-consuming, while our gutter cleaning services are affordable and convenient. 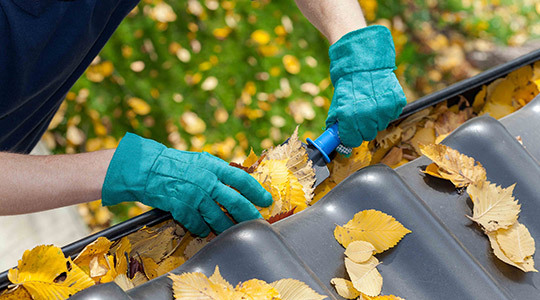 Annual gutter cleaning is an important aspect of home maintenance. Since your eavestroughs sit above your line of sight, it can be difficult to see what’s inside, including debris and dirt. Clogged gutters can lead to a number of problems that are both expensive and time consuming. Professional gutter cleaning in Woodbridge, by contrast, is quick and affordable. We have over a decade of gutter cleaning experience and are fully insured for any liabilities. Our services are safe, affordable, and comprehensive, taking care to clean all of your eavestroughs and related hardware. When your gutters are dirty and clogged, they end up doing the exact opposite of what they’re designed to do. Water can overflow and seep into every part of your home, including the roof and basement. These preventable forms of water damage are all preventable, and all very expensive. We recommend you have your eavestroughs cleaned every year to avoid these problems. We can even set you up on our annual plan, which ensures your gutters are cleaned without you needing to remember to book an appointment. Sealing services: Our high quality sealant can close any leaks in your gutters’ corners and joints. This stops water from leaking to where it shouldn’t be. Downspout guard installation: Downspout gutters catch more water for your downspouts, ensuring more water safely drains away from your home. A one-time service, guard installation keeps water in your gutters and out of your home. Eavestroughs flushes: This inspection finds all the leaks and problems in your eavestroughs and gutters. Once we pinpoint any potential issues, we can seal or replace pieces as necessary. Cleaning out gutters is dangerous work, which is why you need someone with the skills, experience, and tools to do the job properly. With over a decade of experience, we have perfected our cleaning techniques to give your home the best eavestrough cleaning possible. We often clean gutters out by hand, a perfectly safe way to clean gutters that ensures every tiny piece of debris or dirt is removed. For tougher jobs, like after renovations or construction, we’ll use a specialty liquid formula that will get rid of any and all stains. No matter how we clean your gutters, though, they’ll look and work better after a professional cleaning by NICK’S Window Cleaning. Unnecessary strain on your gutters from standing water. Providing high-quality gutter & eavestrough cleaning services in the Woodbridge area, NICK’S Window Cleaning offers service to residential and commercial buildings with up to a maximum height of 3 storeys. The skilled, insured, and experienced NICK’S Window Cleaning team makes certain your property looks exceptional and is in possession of a fully cleaned out eavestroughing and gutter system, ensuring effective water drainage. Customer satisfaction is a very important priority for us, we look to build relationships with our customers and thus deliver unparalleled high-quality services. If you need your gutter or eavestrough cleaned, contact us today and find out why more Woodbridge residents are turning to NICK’S Window Cleaning for their services. Foundation damage is something that every homeowner dreads. Foundation problems can be very expensive to fix but they must be fixed in order to maintain the structural integrity of the home. Water from clogged eavestroughs and downspouts is one of the biggest contributors to foundation problems. Water that leaks into the foundation can freeze and cause cracks. It can also cause the foundation to crumble over time. Getting a professional to clean your eavestroughs at least twice a year can protect the foundation of your home and avoid expensive foundation repairs down the road. The eavestroughs have to be cleaned. It’s not optional for homeowners. But you do have the option to hire a professional to clean them. Professionals who have experience cleaning eavestroughs can get the job done quickly and get it done well. Then you won’t have to worry about clogged eavestroughs causing problems for your foundation or causing damage to your roof or walls. When you need the eavestroughs cleaned and don’t want to do it yourself a professional cleaner is the smart choice. Household accidents cause hundreds of thousands of injuries every year. Don’t let a fall from a ladder sideline you. Professionals that clean eavestroughs every day have access to better quality ladders and other equipment than you do. They have the training and experience to safely use those ladders and equipment to clean out eavestroughs and downspouts. Instead of risking a serious injury trying to clean out your eavestroughs hire a professional with commercial grade equipment and experience to do it for you.